This was originally written back in January to give a literary picture to the Temple Ambler Campus who Roy Halladay is. Sadly it never got publish because, the that issue of the Temple Column, Temple Ambler’s student run newspaper, never got published. There is one thing that Roy Halladay hates the most and that's a visit from Rich Dubee. Now I have seen Roy Halladay pitch many times before in his pre-Philadelphia days. The very first time I saw him pitch up at Yankee Stadium for the Blue Jays, I could tell he was the real deal. I watched Roy pitch up in Toronto over many summers dating back to at least 2004 thanks to my friends from Toronto and the GTA (Greater Toronto Area). I admire Halladay so much that I started to tailor my pitching mechanics like his. So when Roy was traded last December to the Phillies (a few days after my 20th birthday I might add), I decided to create a website that had “facts” about Roy. The following is a somewhat humorous look at who Roy Halladay truly is. And so I ask the question: So you think you know who Roy Halladay is? You could look at his baseball card, but all that will tell you is that he is a six-foot, four-inch, 230-pound right-handed starter for the Philadelphia Phillies. If you look at a website like Baseball Reference, all that will tell you is how he pitched (stat wise) prior to being traded to Philadelphia and of course his current numbers with Philadelphia. It’ll also tell you that Roy is a 13-year Major League veteran who has played 12 of those 13 years with the Toronto Blues Jays. Well, Wikipedia defines Roy Halladay “as a Major League starting pitcher for the Philadelphia Phillies. So I ask the question who exactly is Harry Leroy Halladay (the third)? Well after do some very extensive, painstaking, humorous, and ridiculous research, I have started to put together a picture of who exactly Roy Halladay is. Here is what I found out. Please be advised: don’t read while in class, at a wedding, a funeral, or any place that would condone laughter of the boisterous variety, just sayin’. First off, Roy Halladay isn’t right-handed, he is just bored. The only reason why Roy pitches right-handed, is because pitching left-handed was too easy and he needed a challenge. The fact is, Roy could throw left-handed and still strikeout 10 Mets batters (or 10 Yankees, your choice). Roy Halladay is actually related to the infamous gunslinger, Doc Holliday. The only thing is, Roy Halladay uses fastballs instead of guns and bullets. The truth about Halladay height as well; Roy is actually 100 feet tall, he had to shorten himself to the required “under 100 feet tall” Major League Baseball standard/requirement. He does this so that way hitters might have a chance against him. The fact is: that Roy Halladay is more than just a person. He is a myth and a legendary folk hero. I mean how else could someone out pitch Nolan Ryan and Grover Cleveland Alexander before he was even born? Or could it be than Roy is a figure of mythology much like Odysseus or Achilles? In short I don’t know. Okay so here is the deal after I did my research: yes, Halladay is a right-handed pitcher for the Philadelphia Phillies. We all know that. But Roy is also a legendary pitcher, just ask the New York Yankees whenever they had to face him. There is some scientific proof of who Roy Halladay is. It’s not a lot of proof but there is some. Scientists have tried to find out what the chemical makeup of Roy Halladay. They discovered that the chemical formula, for Roy Halladay is IP9H0BB0K27. Though moreover on the scientific makeup of Halladay, he has his own Periodic Table of Elements. The Table reads: 1Cu (Cutter) 2Cv (curveball), 3Ch (changeup), 4Fu (Brushback), and 5Sk (Sinker). As scientists discovered, any exposure to 4Fu causes instant death. Or did you know that Roy Halladay defies the laws of Physics? Though someone will tell, actually, everyone will tell you that you can’t break the laws of Physics, so scientists had to develop a new theory which has become universally known as the “Roy Halladay Law”. Or how about that whole Pythagorean theory of “A Squared + B Squared = C Squared,” thing? Well it’s not that… what is it in reality? “A Squared + B Squared =Roy Halladay”. Top nerds at NASA and even Al Gore are trying to study Roy Halladay and harness his coolness under pressure to combat Global Warming. Or did you know that Roy Halladay is a concentrated mixture of 10% luck, 20% skill, 15% concentrated power of will, 5% pleasure, 50% pain, and 100% reason to remember the name. Roy Halladay could run for President of the United States and Governor of Pennsylvania, but he is/will be too busy, helping the Phillies win the Division. Speaking of politics and Roy Halladay: Halladay is used by the United States as an effective and legal use of “Torture”. The application of mental or physical torture in order to obtain information or confession from a prisoner is commonly referred to as the “third degree”. The only confirmed act that guarantees 100 percent success in securing information is showing the prisoner a life-size cutout of Halladay holding a baseball, from 60’6″ away. There is a little know fact: for years execution options for convicted death row inmates have included Hanging, Electrocution, Injection and Facing Roy Halladay. To date, none have chosen to face Roy Halladay. Even religion is affected by Roy Halladay. For a person to be canonized into sainthood by the Catholic Church, there must be proof of at least ONE miracle needs to be established. Of all the miracles recognized, it can be said that no saint has ever gotten so much as a foul tip off of a Roy Halladay fastball and it might never be achieved. 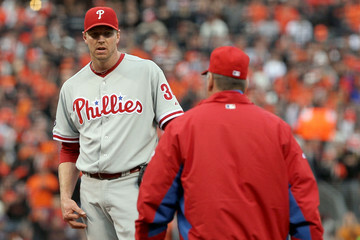 Moreover, if people converted to “Halladay-ism,” it would end all of the world’s religious problems and issues. Did you know that Roy Halladay has a PhD? Of course you did if you have been reading along or have been watching any of his starts. Roy Halladay has PhD in K’s. But did he need to go to college to get it? No. Roy Halladay didn’t need to go to college, because he already had a PhD in strikeouts from a Baseball powerhouse school known as: Dominant Mastery University. Of course Roy Halladay is proof that you don’t need a PhD, MD, or Ed.D to be a doctor or suffer through Med School for that matter. Did you also know that Roy Halladay could be used as a sort of “self-help” or cure for maladies, bad pitching mechanics and bullpen woes? Yep, in fact, I had issues while I was a pitcher in high school. I changed my pitching mechanics to mimic Roy Halladay. I won 20 games and my Earned Run Average dropped five whole points [not 0.05 or 0.50 not even 0.55 but 5.00] to 0.57. This one time Roy Halladay cut his hair and donated it to “Locks of Love” so an 11 year old cancer patient, Kelly, could feel normal. Upon receiving Roy’s hair, she was instantly cured of cancer, grew nine inches, and could throw a changeup that even Roy was impressed with. So that is Roy Halladay, roughly in a condensed version of a nutshell. Roy Halladay is a robust and unique pitcher, ballplayer and individual. So much so, that this very article could not contain the amount of facts on who Roy Halladay exactly is. Just remember these last bits about Roy: all of Roy’s bad outings are intentional as to give his biographer a story arc. Finally, Jay-Z has 99 problems and Roy is ALL of them. Next 2010 Moment: #5 Now batting, left fielder… Roy Oswalt!